We’d love your help. 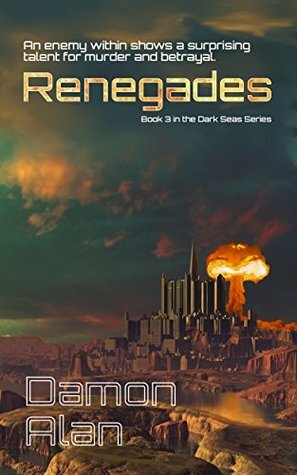 Let us know what’s wrong with this preview of Renegades by Damon Alan. Fleet Captain Sarah Dayson fought the Hive in Book 1. She fought the telepathic adepts in Book 2. Now in book 3 she fights her most insidious enemy yet. Take a look inside for an adventure in betrayal, space combat, discovery of the human potential, and the meaning of loyalty and friendship. The characters you know from the first two books return for more drama, more conflict, more building of the universe in this series. Sarah Dayson planned on uniting her people and the adepts after the death of the tyrant Merik in book 2. A great assembly is called, but she must abandon it at a critical moment to deal with insurrection among her own people. Will she succeed? Will she lose the hearts of the adepts she fought so hard to bring to her cause? Struggling to find peace for her crewmen, Sarah must juggle the politics of a world struggling for identity, a world trying to reach equilibrium between two species of humanity. Not everyone, however, shares her agenda. Some have their own plans.